Sign Up for Your Account Today! Link your online platform with our high-performing email marketing software. You can use our API for numerous calls, including accessing our software’s campaign reporting. Our REST API can be implemented with any programming language. To get started, take a look at our documentation or use one of our sample API integrations. Use the well-documented API to send professional email campaigns using the Newsletter2Go sending infrastructure. We are continually updating our API. The documentation will always have the most up-to-date information about everything you can do with our API. 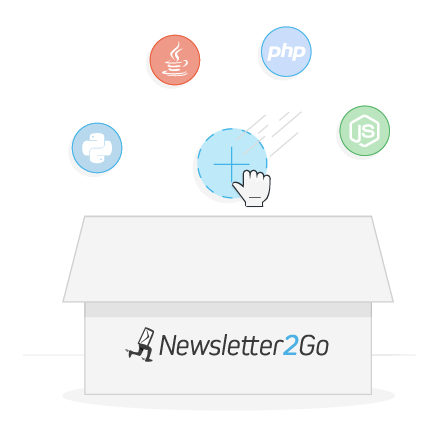 Many features of the Newsletter2Go software can be accessed via API. Contact lists: Create multiple contact lists to comprehensively manage contacts from your e-commerce, CRM and CMS systems. Creating and deleting are both possible using the API. Contact management: Import new contacts from your system directly into Newsletter2Go or manually create contacts. Use a call to check which contacts are on your lists and remove individual contacts. Segment management: Segment your contacts into specific target groups. This way you can make sure to send them emails perfectly tailored to their interests. Use calls to check which segments are in which contact lists. Reporting: Measure the success of email campaigns in real time. Get a quick overview of how your campaigns performed. Triggering and viewing reporting are both possible via API. Create campaigns: Create regular HTML email campaigns and send them using the API. Send campaigns: Set up automated mailings and transactional emails (for example, registration emails, invoices, payment reminders, etc.) and establish the triggers for sending. You can send to entire contact lists, segments or to single contacts with specific attributes.